Last summer, Rich Roll wrote a blog post railing against the hack that went viral. It is a brilliant critique on our shortcut obsessed society, and a plea to remind us to invest in the journey and to devote time to learning how to be your best self -- "the ant-hack." If you didn't see the article, there's now a TED-style video version. It's a good investment of 19-minutes, likely longer than the time it would take you to read the original -- so the video is definitely not a hack, but worth watching. As Rich points out, he was quite surprised to see his article become a meme in social media. What's noteworthy about his post going viral is the fact that it became noteworthy and went viral. He is basically pointing out something that should be common sense, but isn't for most of us. This reminds me of what Michael Pollan said in an interview about his often quoted aphorism: "Eat food, mostly plants, not too much." The fact that simple messages like these get so much attention does indeed tell us a lot about our demand for instant gratification, and how difficult it is to discover and develop helpful and sustainable behaviors and practices. On my journey to be my best self as a plant-based yogi, I dedicate a lot of time to learning, practicing and iterating. There are no substitutes to experience, and certainly no real "hacks" to good health or happiness. I try to approach cooking like hiking a new trail -- generally I know the direction I want to go but I allow myself to explore and play, and sometimes fail. Once I embarked on a hike alone, relying too much on my phone's GPS rather than looking at the trail map. At least when a recipe is a failure, you won't need a rescue party to find your way back home. :-) This was a great reminder that technology can and will fail, so it's important to find reliable sources of information. This holds true especially in cooking and nutrition. So when it comes to learning how to cook healthfully, science-based evidence can be just as important as experience. 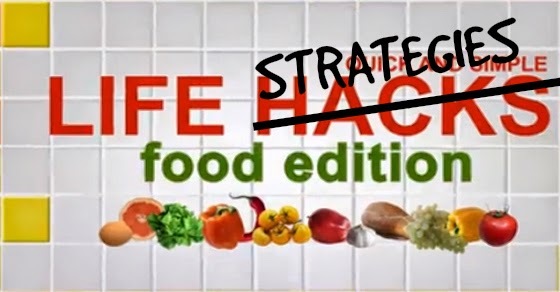 Without further ado, I'd like to share some amazing healthy cooking strategies that are sorta like...hacks! Are there really shortcuts to better nutrition? *3) Garlic Bonus strategy tip: Remember to let your garlic rest for around 10-minutes after chopping before you cook it or use it in recipes. Preparing garlic this way has been shown to preserve cancer-fighting and health promoting enzymes that are destroyed if cooked too soon. WHFood's website updated their fantastic nutrition guide to include this information too. So maybe taking a tiny bit more time or adding a dash of spice -- rather than seeking shortcuts -- is the real health hack ;-) Peace, plants. Namaste.